Angelica is the genus of about 50 species in the family Apiaceae. Garden angelica (A. archangelica) is the most commonly used species of this family which is known for its medicinal and culinary uses. Another popular variety is A. sinensis, also known as the Chinese herb, Dong quai. While much of this family is known for having some medicinal or culinary properties, there are several purely ornamental species in this family. Angelica is reported to have originated in Syria. From there it is thought to have spread and naturalized through Northern Europe. Angelica has been cultivated as a medicinal and culinary plant in Scandinavian countries since the 12th century and in England since the 16th century. Angelica was brought to the Americas by early European settlers and was utilized by Native American tribes as a medicinal herb. According to one legend, angelica was revealed in a dream by an angel to cure the plague, though exact details vary. The plant was believed to be an effective deterent against evil spirits and witchcraft. Angelica is a tall, biennial or short lived perennial (more about this later). It is a tall plant that grows to a height of 4 to 6 feet and has smooth, dark purple or green hollow stems. Angelica has dark green leaves, divided into three parts, each of which is again divided into three serrated leaflets that can grow (in the case of the lowest leaves on the plant) up to 2 feet wide. The leaves can grow large enough to hold water at the base, like a sort of bowl. The roots are branched, from 3 to 6 inches long, thick and fleshy with several small rootlets. The flowers bloom in July and are yellowish or greenish-white (some varieties have and somewhat resembling the flowers of Queen Anne’s Lace. Angelica grows best in moist, fertile, slightly acidic soil and prefers cool, slightly shady areas of the garden with lots of space. It blooms in midsummer of the second year, self-seeds and dies. It is hardy to zone 4 and is not frost tender. To propagate by seed, fresh seeds are the most viable. Seed can be started indoors and stratified at 15-21 C (60-70 F) for germination in 21-28 days. The seeds can also be sowed directly into the ground once they are ripe. Do not cover the planted seeds. Transplant Angelica while it is small and young as older plants dislike being disturbed. If growing together in a plot, place plants 30 cm in row and 60-90 cm between rows. * Make sure the angelica you are growing is right for your intended purpose! *Angelica is capable of being both a biennial and/or a perennial: if you let it flower and go to seed will be a biennial, but if you break off each and every single flower stem that forms, it will grow for at least a 3rd season, and probably no longer than a 4th season. *Angelica attracts bees and predator insects to the garden. Angelica is found in rich thickets, bottomlands, moist cool woodlands, stream banks and shady roadsides. It is similar to several other plants, including some that are poisonous, so be sure to farage with someone that knows what they are doing, or use a VERY GOOD field guide…or better yet, both. *The whole herb, if used medicinally, should be collected in June, prior to flowering, by cutting shortly above the root. *The stem can be candied, and should be cut about June or early July. *Its seeds ripen from August to September and should be gathered when ripe and dried. *The root should be harvested in the autumn of its first year of growth, sliced longitudinally if necessary and dried rapidly, and placed in an air-tight container. The root is the most medicinally active part of the plant but is poisonous when fresh and must be dried thoroughly before use. *The fresh leaves have culinary uses. Angelica is said to have antispasmodic, carminative, diaphoretic, diuretic, expectorant, stimulant, stomachic, and tonic properties. 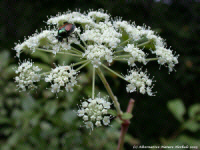 The leaves of angelica can be prepared as a tincture or tea and used to treat coughs, colds, bronchitis, and other respiratory complaints. Angelica can be used as an appetite stimulant and to treat problems of the digestive system and liver. It is said to relieve abdominal bloating and gas, indigestion, and heartburn. 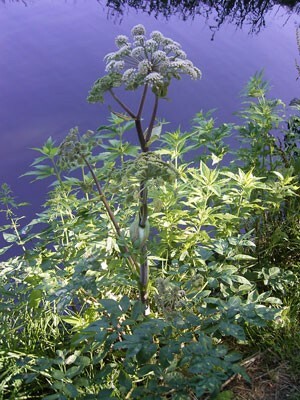 Angelica has diuretic properties has been recommended as a treatment for conditions such as arthritis and rheumatism. Externally, angelica has been recommended as an application to treat lice and some skin disorders and has been recommended as a gargle for sore throats and mouths, as a face-was to prevent acne, and as a treatment for athelete’s foot when used as a powder. Additionally, it has been indicated to have the ability to bring on delayed menstruation, induce abortion and assist in the post-partum delivery of the placenta, when used internally in concentrated dosages. Something to keep in mind when using Angelica is that the leaves are considered gentler in action than preparations made from the root which is more medically active. USE ANGELICA SPARINGLY. It is not recommended for continuous use or for a long period of time – no more than 4 weeks of the equivalent of 1 C tea, 3 times daily or 20 drops of the tincture taken 3 times daily. INFUSION = Pour 2 c water over 1 oz bruised root, steep 5 to 10 minutes. TINCTURE = 1 to 2 milliliters (1 tsp approx) taken 3 times daily, or as labeled using commercial preparation. Essential oils (including phellandrene and pinene and 0.3-1% terebangelene and other terpenes), limonene, carophyllene, linalool, angelica acid, malic acid, coumarin compounds, bitter principle, tannin, resin (6%). Contains about 5% copper salts, carotene, some plant steroids, valerianic acid, pectin, sugar. Furocoumarins, ie. angelicin, bergapten, imperatorin, umbelliferone, xanthotoxin Angelicol, osthole, osthenol, archangelicin, archangin, sitosterol, various acids (aconitic, quinic, chlorogenic, caffeic, fumeric, citric, oxatic). Fruit contains 1% volatile oil, bitter property, coumarins and resin. The seeds contain volatile oil, methyl-ethylacetic acid, hydroxymyristic acid. All members of the genus contain can cause a person exposed to the sun or other source of ultraviolet rays to develop severe sunburn and/or rash. Angelica should not be used by diabetics or taken while pregnant. Avoid getting in the eyes. Do not take with blood thinning medicine. Angelica is considered GRAS (generally recognized as safe) by the FDA, HOWEVER in animal studies, some of the chemical compounds that cause light sensitivity have also been found to cause cancer and cell damage even without exposure to light. Additionally, the essential oil contains safrole, which is a carcinogen. Unlike garden angelica, Dong Quai requires 3 years for the plant to reach maturity, at which time the root is harvested for its medicinal properties. Dong Quai is reputed to be affective for treating PMS, menopausal symptoms, anemia, ulcers, constipation, high blood pressure, heart disease, stroke, migraines, pain and liver problems. There are few human clinical studies involving this herb, and most animal studies have been inconclusive in supporting its use. For more information, try http://www.umm.edu/altmed/articles/dong-quai-000238.htm. Dong Quai is also a primary ingredient in “Four Things Soup” (the others being peony root, dong quai root, prepared rehmannia, and chuan xiong otherwise known as liguisticum wallachi), a traditional chinese formula used for all sorts of menstrual problems. Angelica is considered in some regions to be a vegetable. One recommendation includes the stems to be chopped and roasted with onions until caramelized as a side dish for pork and poultry. Angelica is said to be a good flavoring for fish, particularly as part of a boullion to season poaching liquid. The leaves can be added to salads. Chopped stems can be added to stewed and/or canned fruits (my grandma has a recipe book that recommends using angelica stems to can plums). Angelica is supposed to reduce tartness and lessen or eliminate the need for added sugar by enhancing the natural sweetness of the fruit. The leaves are said to be a good addition when cooking squash or pumpkin for this same reason. The roots and seeds are used to flavor herb liqueurs such as Benedictine, gin, absinthe, and Chartreuse. The root, when powdered, can be used in baking. Angelica is a protective herb. It is also said to be useful for exorcism and purification. It is also useful for divination. It can be grown in the yard or garden to protect the home and sprinkled at the corners of the house to ward off negative spirits and the accumulation of negative energies. Additionally, it may be used in spells that reflect sun correspondences. A light and simple recipe that brings out the best in fresh fish. Soften the butter in a small mixing bowl. Mix in the remaining ingredients, making sure to avoid any pith in the lemon rind. Place the mixture on a sheet of plastic wrap and set in the refrigerator until stiff enough to form a log. Shape the butter about 1 1/2″ thick and cover with the plastic. Freeze the log until you are ready to use it. Slice into coin size pieces so they will melt easily. Place directly out of the freezer onto hot grilled, sauteed, or poach fish. Cut angelica stalks in their second year. Unlike many other plants, the big stalks are actually better than the small, so long as they’re still green (and not purple or white). Deleaf, remove leaf stalks, and cut into pieces of about 6 inches. Soak these pieces in cold water for about 8 hours or so. Cool under cold running water, drain, and peel them, like celery, removing the long stringy parts on the outside of the stalks. Put into a syrup of 1 cup sugar:1 cup water, soak for 24 hours. Drain. Cook the syrup to 225 F, pour it over the angelica. Repeat once a day for three days. On the fourth day, cook the syrup to 245 (small pearl). Put the angelica into the pot, bring it to the boil several times (you want the angelica to look translucent, without losing its shape). Remove the pot from the fire, let it stand til cool, and then remove the angelica. Drain the angelica on racks (or screens). Combine the milk, cream, sugar and angelica in a saucepan. Scald and let the angelica steep for 30 minutes or until you like the flavour. Bring back to a scalding temperature and add half of the cream mixture to the egg yolks, whisking to combine. Return this mixture to the rest of the cream in the saucepan and cook over medium heat, stirring constantly, until the mixture coats the back of a spoon. Immediately strain through a fine mesh strainer into a bowl set in ice water. Whisk to cool the ice cream mixture. Refrigerate until cold, then churn in an ice cream machine according to the manufacturer’s instructions. Love this herb! Thanks for all the information on it…and the recipes too! Pingback: | Welcome to River Village Naturals! Interesting site. Thank you. One question: for the Angelica butter, it says use a “cube” of butter …but how much weight is that cube? ?